Thirty years ago, on 26 April 1986, Chernobyl Nuclear Power Plant’s reactor No. 4 blew up. The explosion took place during a routine cooling capability test and the nuclear fire lasted 10 days, releasing 400 times as much radiation as the Hiroshima bomb. The resulting radioactive cloud contaminated large parts of Ukraine, Belarus and Russia. It was the world’s first and, until the Fukushima disaster, the only nuclear event rated 7 (Major Accident) on the International Nuclear and Radiological Event Scale. 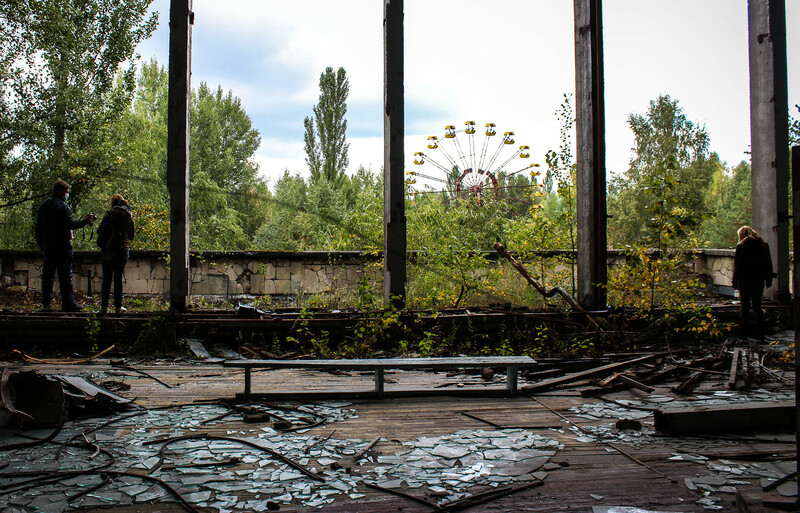 Estimates of human fatalities after the Chernobyl disaster vary widely from 49 immediate deaths from trauma to thousands and even tens of thousands in the years that follow. In the years following the explosion about 350,000 people were evacuated and resettled, about 120,000 of them from the most severely contaminated area. A 30-kilometers radius around the plant was deemed uninhabitable and quarantined. 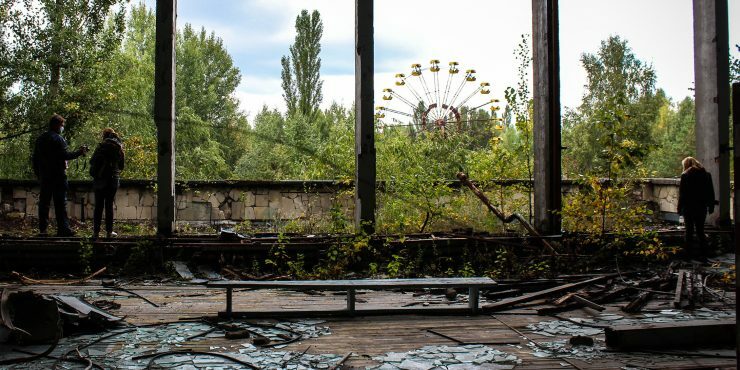 The area, secured with border guards, passport control and radiation monitoring, was designated The Exclusion Zone, The Zone of Alienation or, simply, The Zone. The people evacuated from the area worst affected by the contamination were relocated elsewhere in the Soviet Union, in hurriedly constructed apartment projects. They received a pension and some medical attention. They were initially told they could return in a few days, but as weeks turned to months, it became clear that returning home looked rather impossible. Couple of months after the disaster, thousands of them illegally returned to their homes. Most of them being elderly, the squatters number declined since 1986. Today The Zone is estimated to be home for several hundred humans. They are called “Samosely” (“self-settler” in Ukranian). The soil, air and water in The Zone are among the most heavily contaminated on earth. In theory, the radiation level is far too high for human habitation. However the unlikely community of samosely defies the theory. In a landscape of silent ghost towns, there are tiny villages populated with only a few people. At average, there are ten samosely in each populated village, but houses are very isolated – sometimes you need to walk 15 minutes to the next inhabited house in the village. There are hamlets with just a solitary resident. With a few exceptions, all samosely live beyond the most contaminated 10-kilometer zone around the nuclear power plant. The samosely live a subsistence economy, surviving on their pensions and home-grown food. They breed pigs and chickens and grow vegetables in their gardens. Almost all of them are women, now in their seventies and eighties, the men having died off especially due to overuse of alcohol. Despite their old age, the samosely spend their days farming and chopping wood. The samosely status is semi-illegal. Their residence in the Zone is not legal as it is still prohibited to live there. But they are supported by the Ukrainian State Agency on Exclusion Zone Management and the Ministry of Social Policy. The Governmental institutions provide services, transportation, telecommunications, burials, organize visits to the squatters from outside the zone. All the villages still get electricity, which is paid for by the pension received from the state. Many samosely have a TV. Nobody has running water. For a while, Chernobyl had a shop and there are two mobile shop vans going around the villages. Once a month the authorities provide transport to the nearest town. Of all 16 Eastern Orthodox Christian churches present before the Chernobyl disaster, there is one still operating, St. Elijah Church, in the city of Pripyat. Apart from samosely, human presence in the Zone is limited to the workers involved in construction, administration and research. Some 2,000 people work there patching up the cracked sarcophagus which was hastily constructed by Chernobyl liquidators in 1986, in management of radioactive waste, water management, and forestry. Several hundred people work for The New Safe Confinement project, designed to make the old shelter and remnants of the damaged reactor safe. Completion of the project is scheduled for the end of 2017. These workers operate on tightly controlled shifts (the longest time being 15 days). Their health is closely monitored and they have a daily and annual radiation exposure limit.